As a child I was always painting or making something, often houses out of tissues and boxes. My mum introduced me to watercolours and I say to everyone that she taught me how to paint with them. I found this little felt tip doodle when going through some old books and was amazed that even as a child I liked pattern and detail. I was not aware of this love of colour, pattern and detail until nearing the completion of an illustration degree at the University of the West of England. Watercolours to me are like a magic painting book building up the colours on the page, watching them change colour as they get mixed, by placing one on top of the next. I only ever use four colours which is a slight variation on the printing primaries, yellow orchre, turquoise, permanent rose and purple to help get the darker shades. Captain Rupert rabbit is my trusted painting companion although he can mainly be found sitting in flower pots and eating wire cables, you can catch up with his many adventures on the blog. Felt tip doodle aged around 10???? 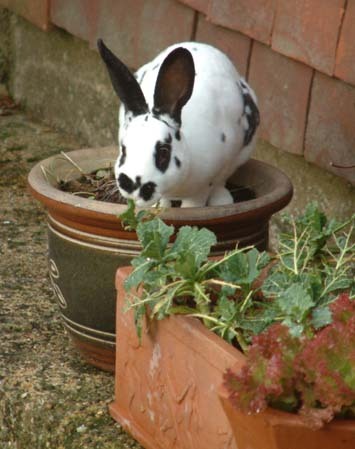 Dylan the flower pot bunny.